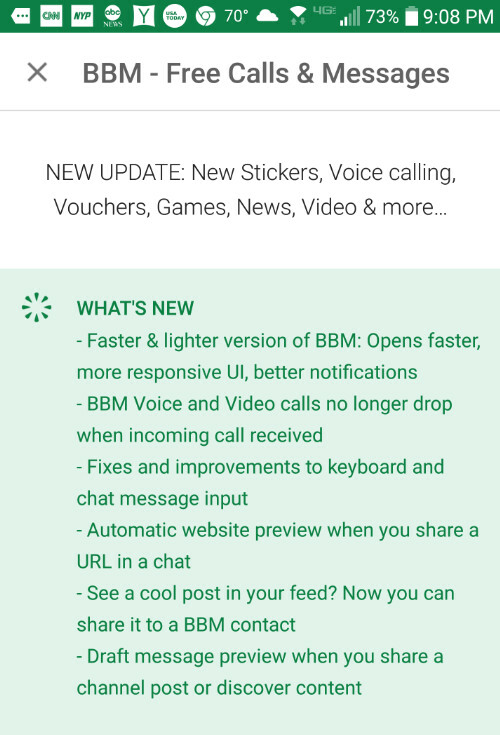 The BBM beta app for Android has received an update that adds several new features that will probably make their way to the non-beta version of the messaging app. Just last month, the BBM beta app became available from the Google Play Store and signing up is as easy as 3.14. Also, if you become a beta tester for the app and change your mind, all you have to do is uninstall it. One of the new features in the beta allows those with an Android powered BlackBerry handset to quickly import contacts from BlackBerry 10. To do this, go to the Me tab and then to Contacts. There, you will paste your exported BB10 contacts list which will be imported to your Android contacts. As for the remaining changes and additions to the beta, you can check out the changelist by looking at the screenshot that we've embedded to this story. No need to thank us, it's just what we do. To sign up for the BBM beta for Android app, make sure that you have the regular version installed on your phone. Then, simply click on the sourcelink directly below and follow the instructions. Congratulation BB on the new BBM version. The old BBM version really need an update. Because it doesn't have any standout feature compared to others. I hope BB won't need circus anymore (paying user to use BBM) in the future with this new version of BBM. With them being so big on software, I have a funny feeling that they will find some way to monetize BBM since they are losing market share with BBM. The sad things for BBM user is the way BB selling the BBM user to advertiser. Its feel like a cheap free software. Not a professional software. Used to use BBM a lot before, now none of my contacts use it anymore. All shifted to Telegram, Facebook messenger, Viber. Everyone use BBM. Your 'contacts' are big loosers who surrender their private lives into the hands of social media thugs. Use BBM, the world's most advanced, most secure and most widely used IM Client that's about to surpass What'sApp and Messenger in terms of active users to become the world's greatest and most feared IM Client. The call of duty. Join The BBM. For productivity. For patriotism. And for our freedom. G'Day! Patriots use SMS/MMS/RCS. Supporting their local carrier. I believe telegram is equally secure. Mine too... BBM used to be something defining businessman from the rest. Now, BBM is mostly used by second hand old BB user and their friend/family. Same here. Unless you have other users who have BBM, it's practically useless since the other party has to have BBM and it isn't able to be used as an alternative SMS app. Why would you use BBM to send SMS? BBM have too many ads. I would prefer use regular SMS apps with RCS support. Agree with you. Unless you known someone who still use 6-10 years old device (old BB device), there is no reason to use BBM. BBM have fallen from 'used by VIP' to 'used by $15 second-hand phone user'.